Two ball bearings welded together, an LED torch that slowly morphs from one colour to another when you switch it on, and a small straw, all packed in a smart presentation box. 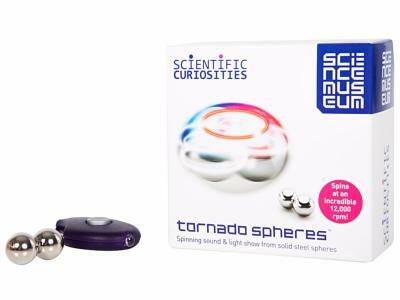 Welcome to Tornado Spheres!Place the ball bearings on a smooth surface and give them a spin with your fingers. Then use the straw and blow to one side of the spinning ball bearings, which will cause them to spin faster. Then switch on the LED torch, and watch the fascinating light show! Ok but disappointing. Not really worth the money. Money best spent on something else easier to use and more impressive. Nicely packaged. Performed as expected. A nice addition to my collection of curios. Works a treat. What more is there to say! I had to practice a little before learning to made these spheres spin long enough to appreciate the colour effect, but once learned, they're awesome. I like the idea of the light show with the colour changing LED torch. Fun toy for a while, cool to show off. Fijn dat je er een werkend lampje bij krijgt.